A 2012 study found bisphenol S, a BPA alternative, on 100% of cash register paper in the United States, as well as on 87% of paper currency and 52% of recycled paper. According to the study, people may now be absorbing 19 times more of the powdery film through their skin than when BPA was used to coat receipts! Now found on cash and receipt paper, endocrine disruptors like BPA and BPS have been linked to health problems—even cancer. This year, another study found that BPS has some of the same endocrine-disrupting effects of BPA, and that it interferes with how cells respond to natural estrogen—an important part of the reproductive process. As parents, why should we be worried about these endocrine disrupting chemicals? Well, first off, they’re everywhere—even on receipts and money. Our kids are exposed to them through multiple sources practically 24/7. And multiple studies have shown that even at very low doses, endocrine disruptors like BPA and BPS can dramatically change our hormones. That’s not a good thing for anyone, but especially for a developing child. Take a look at these five ways to reduce your family’s exposure to BPA and when it comes to receipts, focus on this one: Try to use credit cards instead of cash, and in the same way you might politely decline a plastic bag, just ask the cashier to throw away your register receipt. Then remind her to wash her hands. I know, it’s nuts! So the main thing to know when you’re handling coated paper receipts and currency is that you should wash your hands when you are finished, and don’t put your fingers in your mouth. Here are some more ways to reduce your exposure in general: http://www.mommygreenest.com/what-is-bpa/. I hope this helps, Heather! This is unbelievable… What can we do about this? 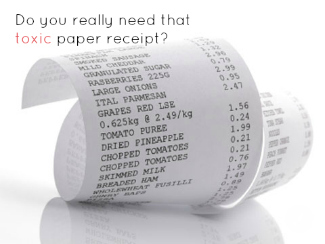 What if we need the receipt for our records?